News that oil giant BP is to accelerate its redundancy programme underlines how the industry is being squeezed by the tumbling price of crude. Companies that had been riding the crest of $100-plus oil are facing a reality check. What looked like a good investment at $100-a-barrel doesn't look so profitable at $60. Across the sector - from super-majors like BP, services giants such as Halliburton, and minnow explorers in the depths of Africa - the question is the same: is the 40% fall since June the new normal, or a blip in an otherwise long-term upward trend? This week, analysts at investment bank Morgan Stanley warned that oil could fall to $43 a barrel in the second quarter of next year unless oil producers' group Opec bolsters the price by cutting production. But in truth, no-one really knows for sure where the price is going. In the meantime, companies like BP are forced make contingency plans ahead of what could be a tougher climate. "The fall in oil prices has added to the importance of making the organisation more efficient," a BP spokesman told the BBC. A company the size of BP can at least play the long game. Hundreds of smaller and mid-tier oil and gas explorers - and their investors - will be rethinking their business plans urgently. Many of these firms do not have the financial muscle to withstand a prolonged price fall. Analysts predict a wave of mergers and acquisitions as firms seek out rescue deals, and falling share prices create bargains for larger predators with deeper pockets. "A lot of these companies have smaller budgets and are more exposed," says Graham Sadler, managing director of Petroleum Services Group at business services firm Deloitte. 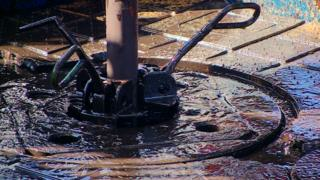 Many will try to spread the risk by, perhaps, sharing drilling rigs and other facilities. "But a lot of drilling will be pushed onto the backburner," he predicts. However, industry juggernauts in the US and Europe will not escape the need to change course, especially when leasing an oil rig can cost anywhere between $50,000 and $600,000 (£30,000 and £380,000) a day depending on the demands of the project. Mr Sadler says that drilling in high-cost places like the Arctic and deepwater locations could be casualties as the big players cut back on costs. Projects that have already received billions of dollars in investment will probably be safe. Others that have yet to leave the drawing board will likely be put on hold. That the oil majors are being hit by falling prices is reflected in recent speculation that BP and Royal Dutch Shell are in merger talks. This old chestnut surfaces every few years when the oil price falls sharply. But it underlines that in tough times even the giants of the sector are expected to be searching for economies of scale and better pricing power. And remember, BP turned itself into a global player via a bold acquisition spree in the late 1990s, when the low oil price threw up takeover opportunities. Author Daniel Yergin, one of the foremost authorities on the industry, wrote last week in a Wall Street Journal article: "Even before the collapse in prices, major oil and natural-gas companies had become preoccupied with the continually rising costs of developing new supply and were heeding the call from investors for 'capital discipline'. "This price decline will turn this preoccupation into an obsession. The result will be a slowdown and reduction in major new investments around the world." And this will hit another big part of the industry - the services sector that provides the rigs, drilling and extensive support to companies like BP or Exxon. Robert Perkins, an oil expert at Platts, the industry information and news organisation, says services companies were already reporting a slowdown before the recent crude price fall. Last month Halliburton and Baker Hughes, the sector's second and third largest players behind Schlumberger, confirmed they were in merger talks. Halliburton shares in particular have slumped on fears that the company faces an new era of fewer contracts and declining revenues. A merger deal between the two companies that would normally take months to draw up was reportedly put together within weeks. "It is a sign of the times in the sector," says Mr Perkins. "The service sector has been in decline since last year." One area where the costs of exploration and development are particularly high is in Canada's vast oil sands region, where crude is extracted from tar-like deposits. The Canadian media has been awash with reports of companies warning about project delays and budget cuts. On Monday, Canada's Talisman Energy, which owns assets in the North Sea, said it had been approached by a number of parties, including Spain's Repsol, about potential deals. Talisman's North Sea production has been a particular problem for the company, a situation unlikely to improve in the short term. "Investment by the oil companies in the North Sea will likely be halted on the basis that it is not economical to either invest - let alone pump oil - below $60," said analyst Howard Wheeldon in a recent note. Deloitte's Mr Sadler says the North Sea production costs have been rising because much of the easy-to-get oil has been extracted. Some fields will "start to struggle" if the price remains below $70 for a lengthy period, he says. At the root of the recent oil price fall is booming production in the US, and particularly the shale gas revolution. Opec's decision last month not to cut production was said to have been an attempt to put pressure on US producers, which have high break-even costs. As with companies, many Opec members needs a high oil price to bring in much-needed revenues. But while there is certainly concern in the US about rising production costs, one telling set of data suggests that US drillers are not yet ready to cut back. According to Baker Hughes, the number of oil drilling rigs leased in the US increased by three to 1,575 in the week to 5 December, and is up more than 200 on a year ago. It hardly suggests an industry in the grip of contraction. Fadel Gheit, a senior analyst covering oil at Oppenheimer and Company, told the BBC that prices would have to fall significantly to really force any producer in the US out of business. He said: "Five years ago the industry required about $90-plus per barrel of oil to invest in new projects, but today this number is close to $60 or $65 per barrel." That's because of efficiencies brought about by improving technology." It's a cliche to say that there will be winners and losers. As companies have widely different cost structures and resources, the impact of falling prices will be different. Perhaps all that can be said with certainty is that if the price falls further and for longer, the industry landscape will look very different.